The wine glass is from a wine tasting event put on by a club I was in during my senior year of college. 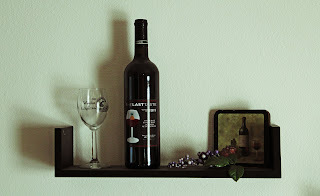 The bottle of wine is a commemorative bottle of red wine from “The Last Taste,” an event that I attended (and helped plan through another club I was in) on my graduation day. The grapes I already had from a long time ago, and the coaster I found at Goodwill for 99 cents. 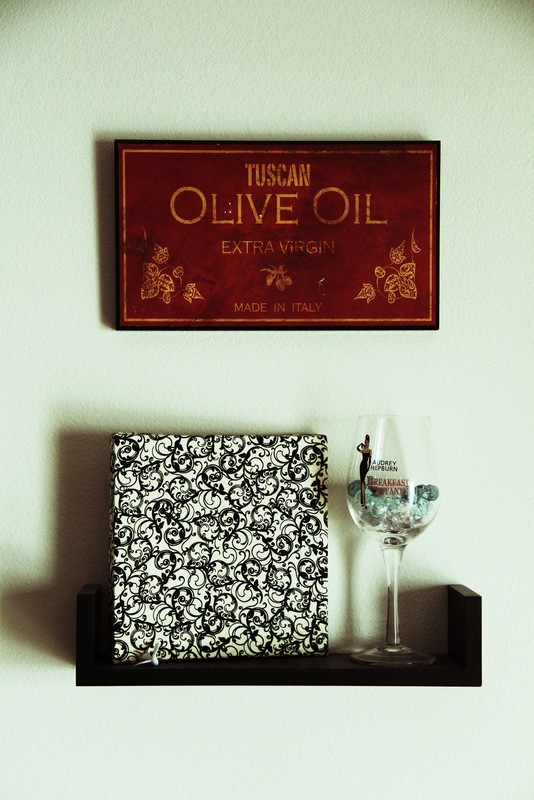 I hung this little “Tuscan Olive Oil” picture above the center shelf. It was handed down to me from my mom. Lucky for me, I have a mother who likes to update her kitchen from time to time; meaning I get to capitalize on the things she gets rid of! On the shelf, I made a black and white canvas simply by purchasing a blank canvas from the Kraft Warehouse along with a small sheet of fabric I liked. I then cut the piece of fabric down and stabled it to the back of the canvas. Very easy and fast! The wine glass was a gift from my best friend. It’s a Breakfast at Tiffany’s wine glass, so I had to use it for decorating rather than its actual purpose (since I adore Breakfast at Tiffany’s.) I put leftover gems and fake diamonds from my bridal shower inside the glass, as well as a tea light. 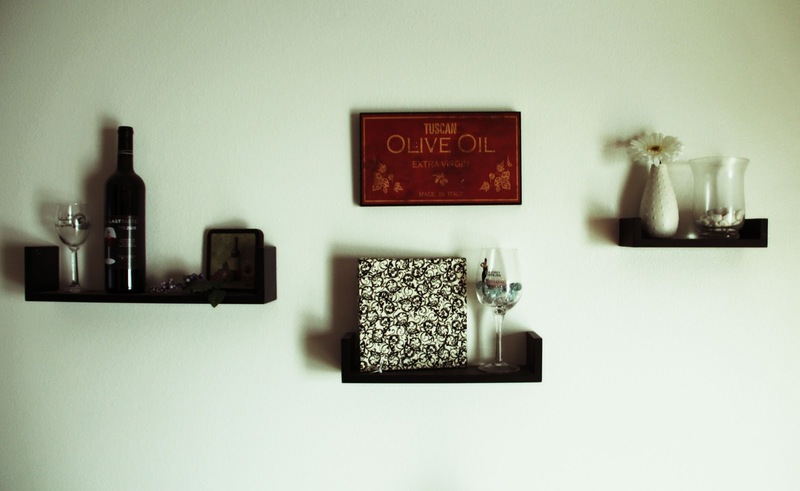 The smallest shelf is the simplest. 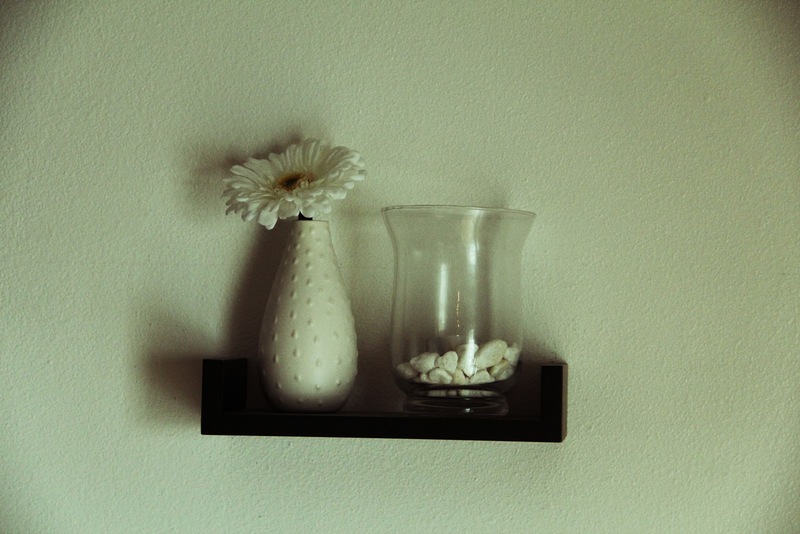 The small white vase was 99 cents from Ikea. I had made a bunch of “flower pens” by taping a sunflower to a pen, and I just stuck one of the pens inside the vase. So, the white flower shown can also be used for writing. :) The glass vase was from the dollar tree, as well as the white stones inside of it. I placed a tea light inside as well. Very simple and very inexpensive. This idea was not planned. I was browsing at Goodwill with my mom, when we came across this four pack of silver cups that were still in the box. We immediately thought they were adorable, and snatched them up for only $1.99. We went to the Dollar Tree next to find some flowers to put inside. I stuck to yellows and whites because it was summer at the time, but I am thinking about swapping them with red flowers for the holiday season. I love how they turned out! Here is my favorite part of my drop-down cupboards! The two coffee “art-works” were hand-me-downs from my mom’s kitchen. 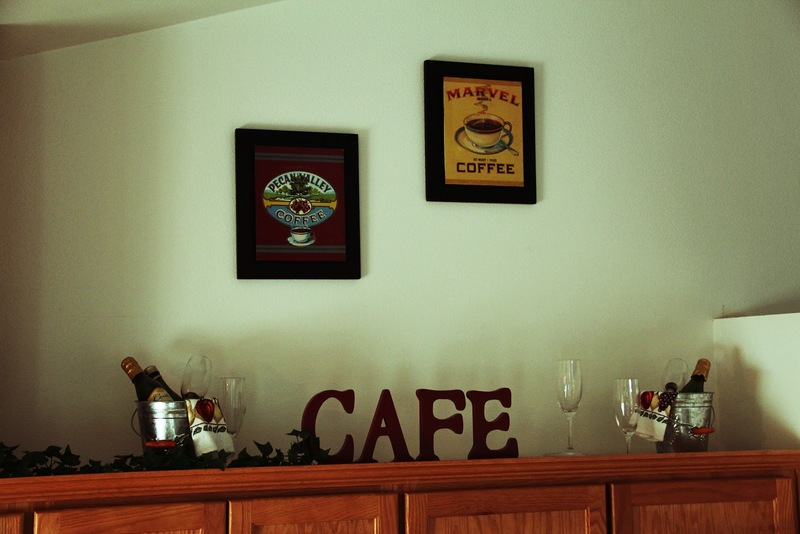 The “cafe” lettering was a gift from my mom. The champagne flutes were left over from my bridal shower, and the little champagne buckets I will break down below. I love these little champagne buckets. I found two of these little silver buckets at Goodwill for 99 cents each. You can’t tell very well from the picture, but they have grapes on them. I knew they would be perfect for something, I just had to brainstorm! From then I decided that I could put mini champagne bottles in them and make cute little champagne buckets! How adorable. The little grape hand towel was an awesome touch I found at the Dollar Tree. They came in a two pack, which was perfect. One for each bucket! And finally, the mini bottles of champagne I was able to purchase in a four-pack. 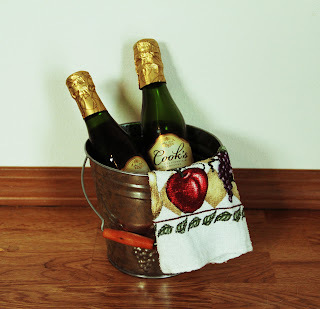 I used an old hand-towel inside the bucket to position the bottles perfectly, and voila! They are just the touch I wanted for my cupboards! 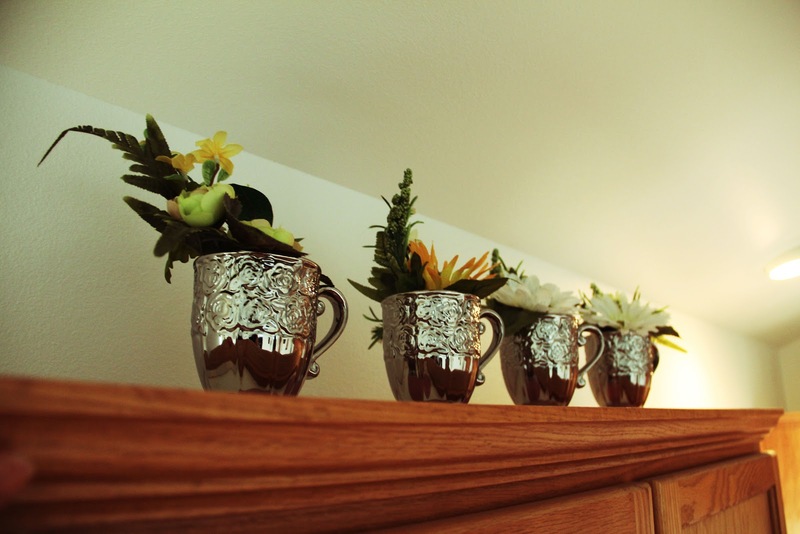 These are just a few home decorating ideas I’ve used in my own home that are very inexpensive. Getting creative with things I’ve found at Goodwill and the Dollar Tree, plus using what I had already or what was given to me, I have been able to decorate on a budget. More ideas to come!